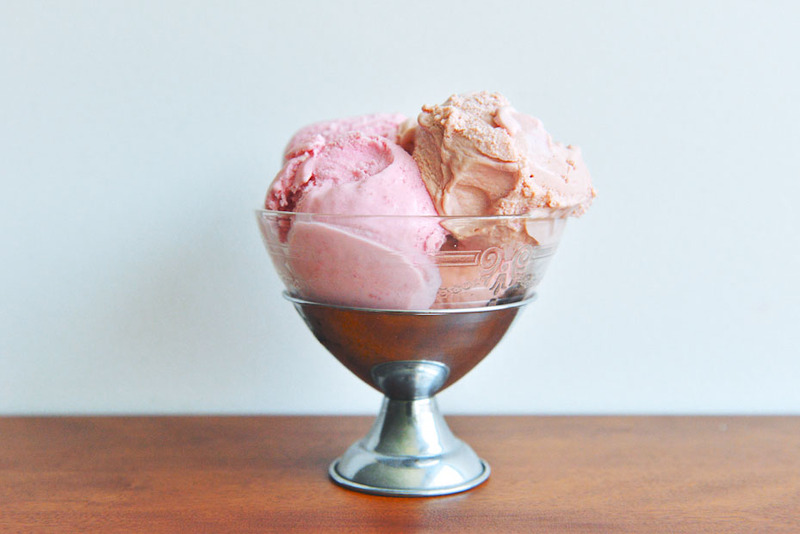 This classic, crème anglaise-based ice cream is lighter in color, and is a little softer and more scoopable right out of the freezer. It’s more roundly creamy, and less bright-raspberry forward. 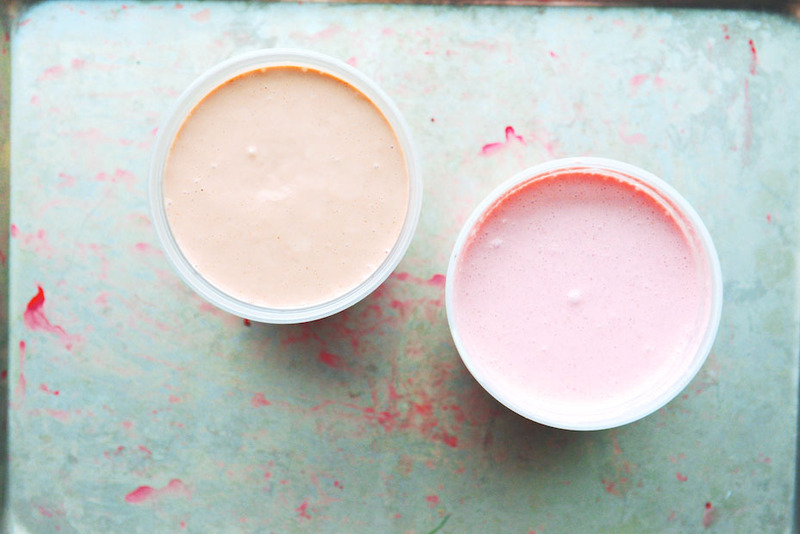 It has a more complex flavor, and more of a dairy finish. In a medium pot, whisk together the milk, cream, milk powder and 1/2 cup of the sugar. Bring the mixture to a simmer, and then turn off the heat. When the ice cream base is cold, mix it again with an immersion blender, 3 minutes. Then, pour the custard base into an ice cream maker. Let the machine run based on the manufacturer’s instructions, about 20-25 minutes, or until the ice cream reaches the consistency of soft-serve. 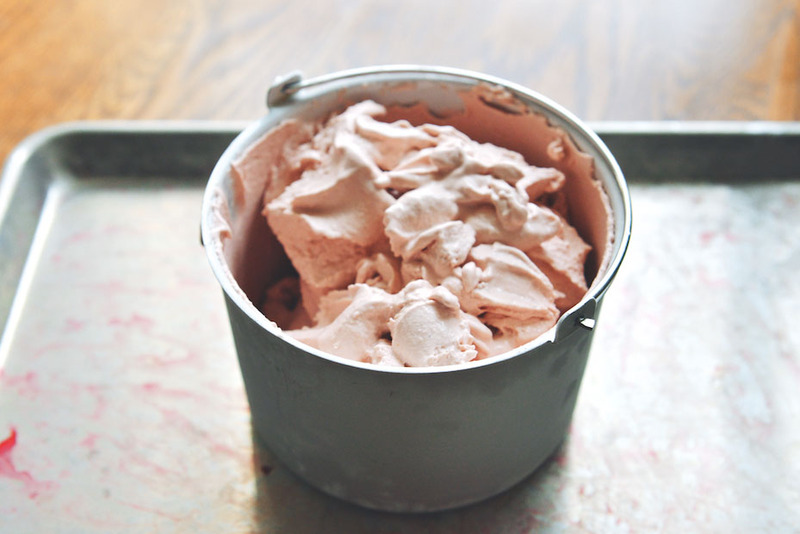 Spoon the ice cream into a container, and then freeze for at least 3-4 hours. 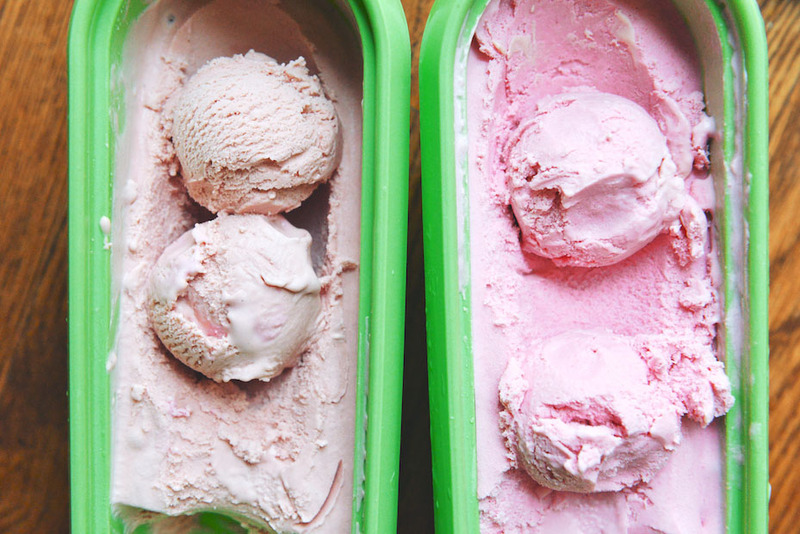 Take the ice cream out of the freezer 5-10 minutes before serving. I got the idea to use gelatin from Christina Tosi via Leite’s Culinaria. I thought it might be “easier” than making a traditional ice cream. This eggless version is brighter in color, and has a more fruit-forward flavor, putting me in mind of sherbet. It’s still creamy though, and melts creamy on the tongue. It has a straightforward raspberry finish. Pour the powdered gelatin into a small bowl. Add 1 teaspoon water to the bowl; give it a quick stir to distribute the gelatin in the water. Leave the bowl alone for 5 minutes. 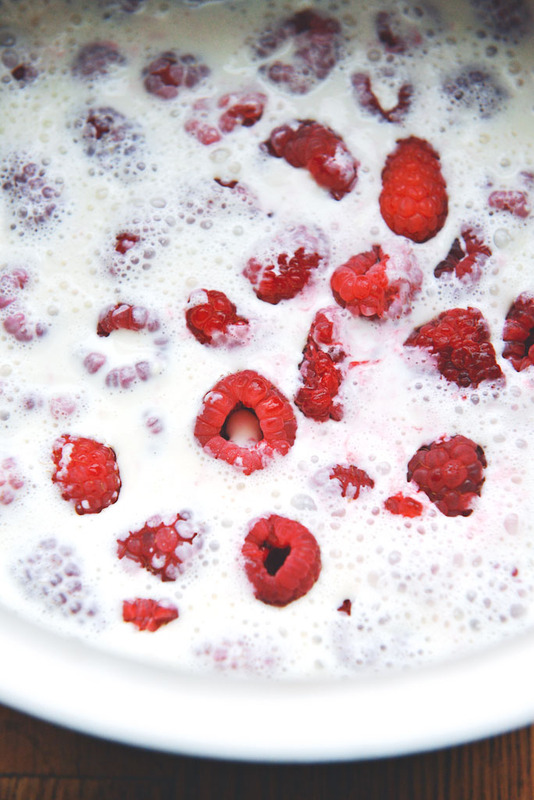 In a medium bowl, whisk together the milk, cream, milk powder and sugar. Spoon a couple tablespoons of the milk mixture into a separate small bowl; microwave for 10 seconds, just until slightly warm. By this point, the powdered gelatin should have absorbed all the water. (It will be the color of champagne, and a soft solid.) Whisk the warmed milk into the gelatin, until the milk mixture is smooth. Whisk the vanilla and the brandy into the mix. 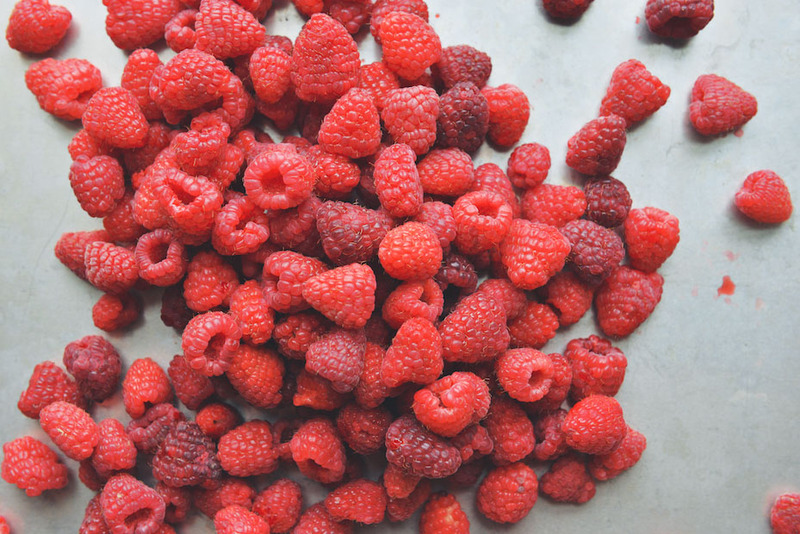 Add the raspberries to the bowl. Blend with an immersion blender for 30 seconds. After that, run the base through a sieve, to remove the raspberry seeds. 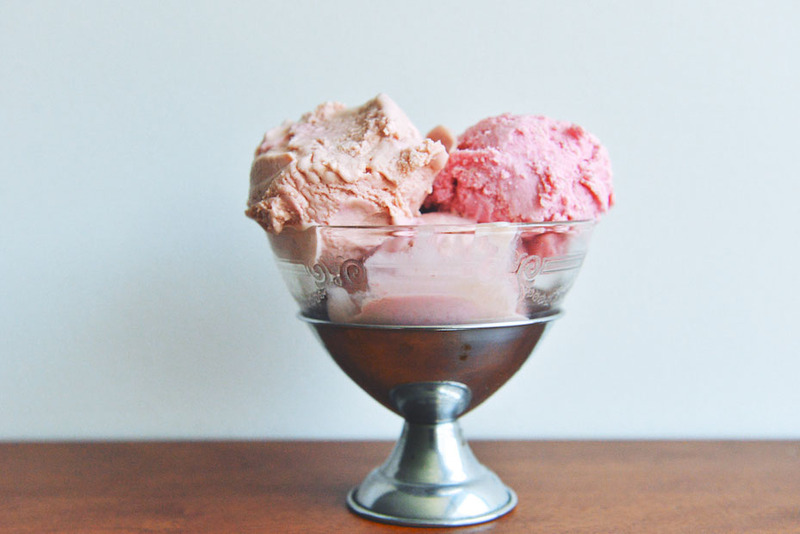 Move the ice cream base to the fridge for a few hours, or overnight–you want it as cold as possible. Pour the ice cream base into an ice cream maker. 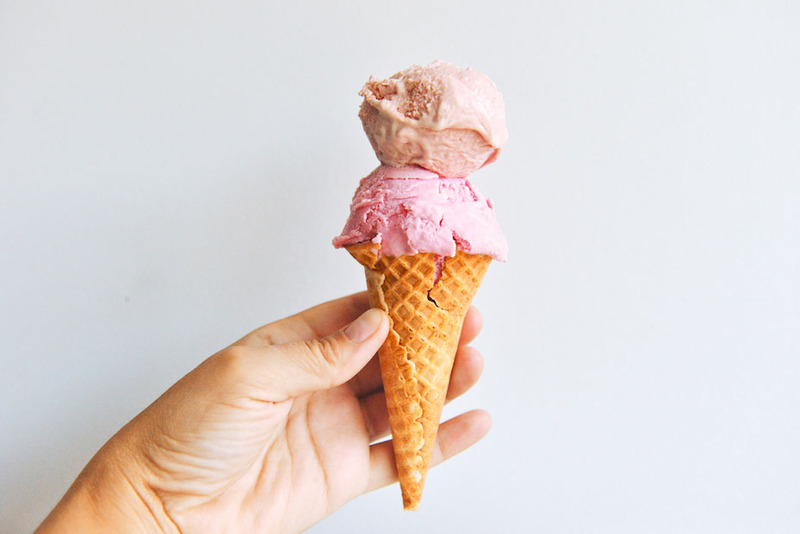 Let the machine run based on the manufacturer’s instructions, about 20-25 minutes, or until the ice cream reaches the consistency of soft-serve. 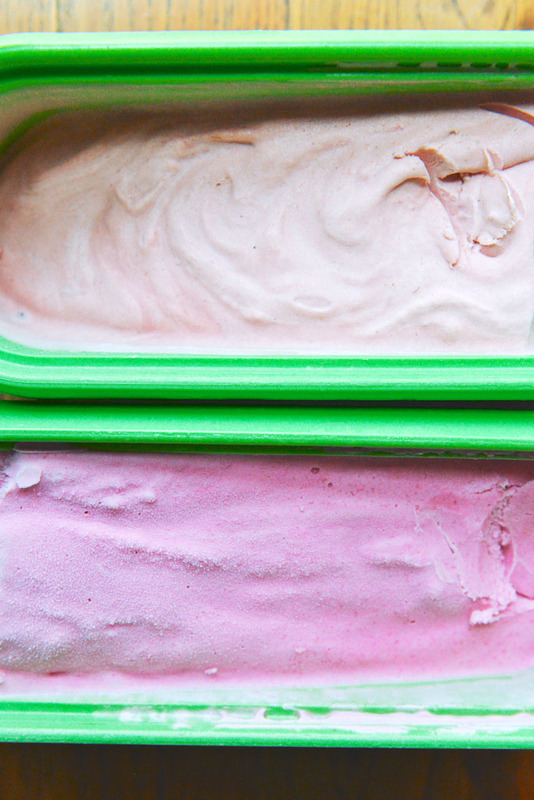 Spoon the ice cream into a container, and then freeze for at least 2-3 hours. 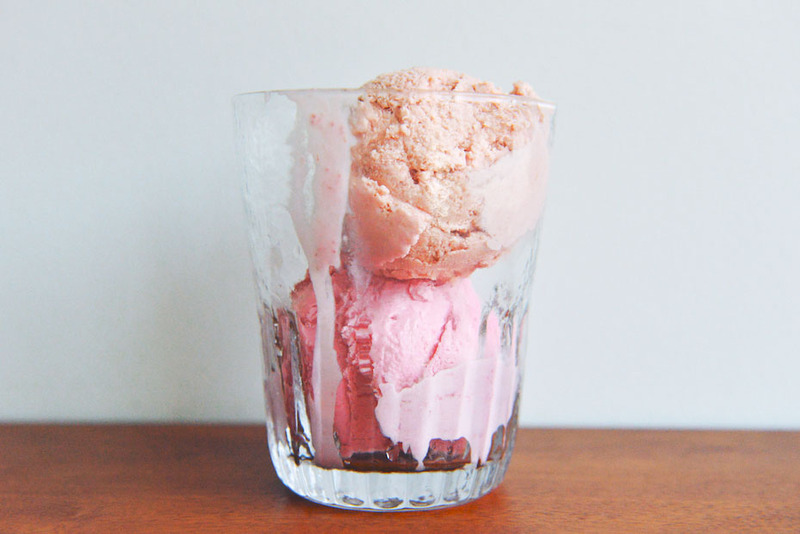 Take the ice cream out of the freezer 5-10 minutes before serving. Oh yum! Yes to both of these! These pictures are stunning! 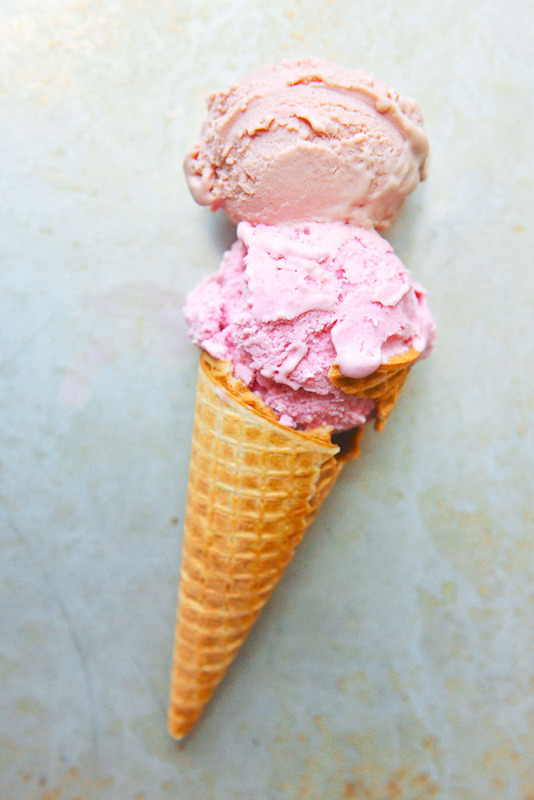 Both ice creams are such gorgeous shades of pink! 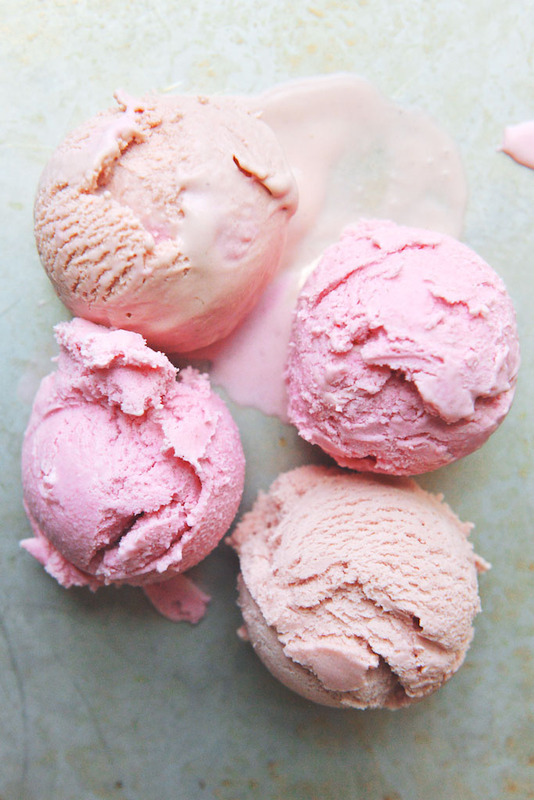 I absolutely loooooove raspberry ice cream. It is by far my favorite ice cream flavor (other than chocolate, I mean c’mon). I am aching to make some ice cream before the summer is done! This looks heavenly. 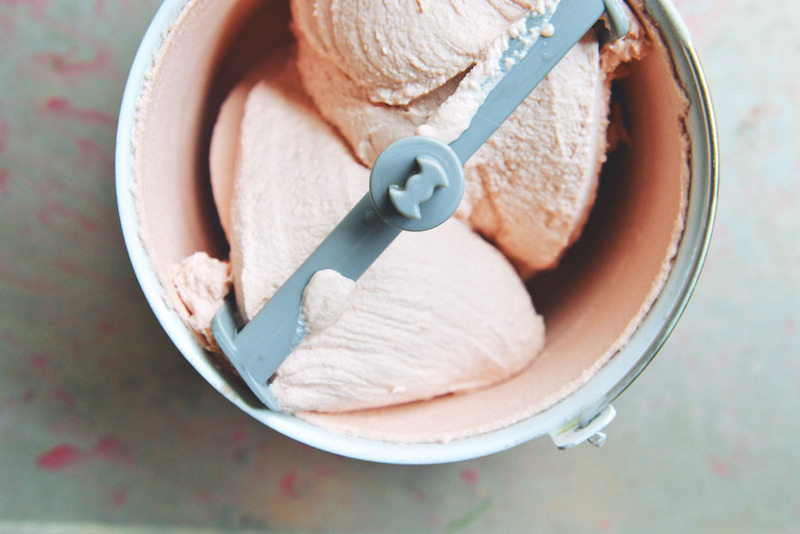 What kind of ice cream maker do you use? I want to buy one and I would love a tip! Looks so good! I love raspberry flavored ice cream with a drizzle of hot fudge. Yum!